Front zipper hidden behind fabric prevents ingress of dirt and dust. Large in size – designed to be worn over other clothing. 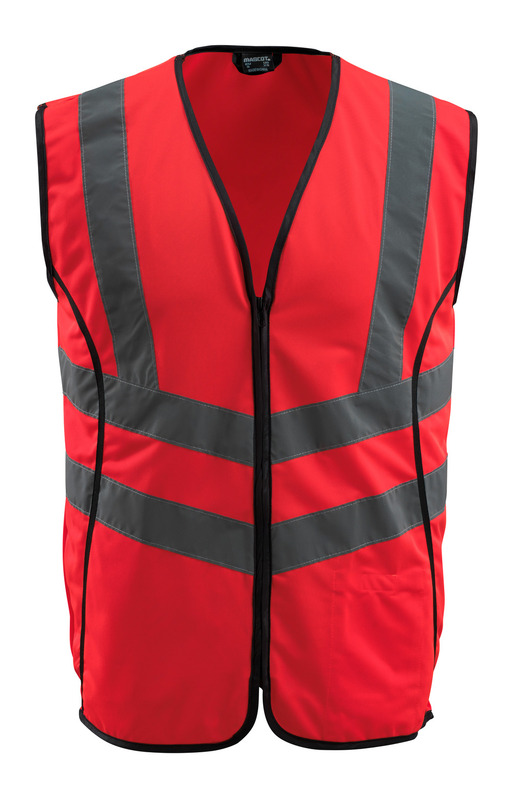 Extra visibility with the help of vertical and chevroned crossed reflective strips. Warp knit.Shrinkage max. 5%.The product will retain its qualities for a maximum of 25 domestic washes. Fluorescent and with vertical and chevroned crossed reflective strips. Zip right through. Inner pocket. Edged with band. Large in size – designed to wear over normal clothing. The product is certified with maximum 0,0400m² logo area. This approved area must not be exceeded. Logo on, respectively, front or back of the product can constitute only a maximum of 50% of the total approved logo area in order to maintain the EN ISO 20471-certification.